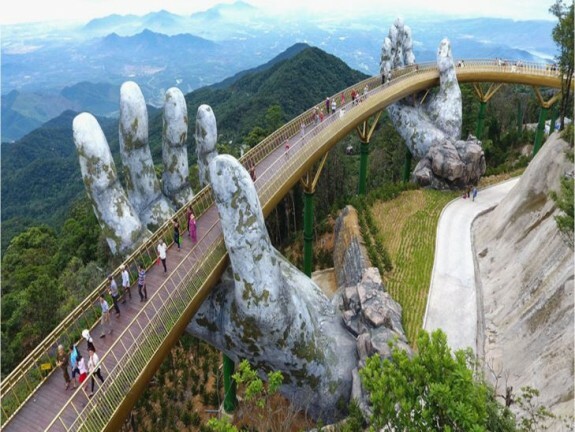 The Golden Bridge is a 150-metre (490 ft) long pedestrian bridge with 5m wide in the Bà Nà Hills resort, near Da Nang, Vietnam. It is designed to connect the cable car station with the gardens to provide a scenic overlook and tourist attraction. The bridge loops nearly back around to itself, and has two giant stone hands designed to appear to support the structure. The client for the project was the Sun Group. The bridge was designed by TA Landscape Architecture based in Ho Chi Minh City. The bridge was opened in June 2018. The Golden Bridge is Awesome. But is it possible to design the same bridge with just two hand support?